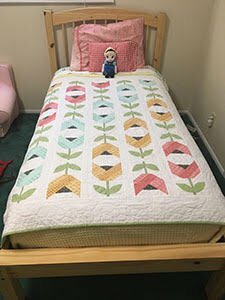 This a super cute quilt that's not too tricky! It's for a confident beginner. The tulips and stems are pieced, but then the leaves are appliquéd on. Two different appliqué methods will be demonstrated. The tulips in the sample are made out of Lella Boutique's Sugar Pie line, but as long as you have three sets of two coordinating prints, you can use what ever fabric you'd like! Fabric requirements are attached, and as a word of caution, I would avoid directional fabric! Once you sign up for the class, cutting instructions will be provided to you as well. Pattern fee of $6.00 - pattern will be available at class.